The fresh, uneven snow on the long descent to Truckee made it more challenging than usual. Actually, it’s challenging in a different way every time, and I thought to myself, “That’s what makes it Great. That’s why it’s called The Great Ski Race.” And it had been a Great adventure even before the race start. Saturday, 11:47am: It was dumping rain. Lots of my trail running friends were starting their season with the Way Too Cool 50k – I waited for results to come in. I texted friends, claiming only a 10% chance that I’d ski the next day. Ski/run buddy Pete Broomhall texted back, “You should race it’s gonna be fun.” He said he was coming over to wax his skis in any case. Saturday, 3pm: Torrential rains continued. We waxed for wet, warm conditions. I chose my “not best skis” given the already-iffy snow coverage being dissolved by the rain. The weather forecast was confident it would get cold and turn to snow overnight, but I know the Sierra Snow and stuck with my guns to wax warm. Pete again shared his super-awesome “Speed Powder” pure fluoro top coat, circa 1980. Saturday, 7pm: Race organizers sent the email with an upbeat report on the nasty course conditions, including the statement, “Maybe bring something other than your best skis & boots.” They detailed three sections that were not currently skiable, about 1km total. I really wanted to bring my best boots. Earlier this season I made an impulse splurge on Fischer Speedmax carbon fiber skate boots. They are so light and fit like glass slippers. I really, really enjoy skiing in them, but can’t imagine subjecting them to 1km of running, some on pavement. Saturday, 8:11pm: The noise of rain pelting on our metal roof faded away. It took me a few moments to recognize the sound of silence. It was snowing. I went to bed happy and slept better than I had for weeks. Sunday, 6:20am: Sunshine through broken cloud cover revealed a solid 10″ of heavy, fresh snow on our deck. Game on! It’s gonna be a beautiful day to ski from Tahoe City to Truckee with hundreds of other people. Sunday, 9:03am: I took off in the front of Wave 2. The start of this race is crazy, trying to hold your position while keeping your poles close enough that they don’t have an unhappy encounter with someone else’s skis. The course starts with a 7-mile climb to the top of Starratt Pass (7800′) before 11+ miles of mostly descending. After about 15 minutes of settling in, I found my spot near just a few skiers. I started my music in one ear bud and went to work. The effort was physically hard, but easy on the mind. I had been craving the opportunity to race that climb again and was happy to be there with my fast wax and glass slippers. I had prepared my iPod to repeat some of my favorite pop music for climbing, including Meghan Trainor’s “All About that Bass,” reminding me to use my glutes to get from ski to ski. I hunted the Wave 1 skiers up the climb (they had a 3-minute head start) and was encouraged each time I passed one. Sunday, 9:59am: I reached the top of the big climb (Soup Station #1) in 56 minutes, about 10 minutes faster than my previous best time up. I didn’t stop for water or food and got ready to face the uncertain conditions on the never-ending descent to Truckee. My skis were flying as I came upon a tall yet graceful dude whose skis weren’t going too fast. It turned out to be good friend and Ski Orienteer Extraordinaire Greg Walker. “Oh, Hi Darling! What, you forgot to wax?” Seconds later I found myself on the ground as payback for (a.) trash talking, and (b.) not paying attention to soft snow through the turn. I average three falls on The Great Ski Race descent. I had two more to go. The next fall was soft and random as my ski just encountered some snow irregularity. Ok, I just need to stay upright from here to Truckee, I told myself. Still talking trash with Greg at the finish. Photo credit Jenelle Potvin. Soft snowflakes started to fall as I skied through Tahoe National Forest. I just couldn’t believe that I get to do this. 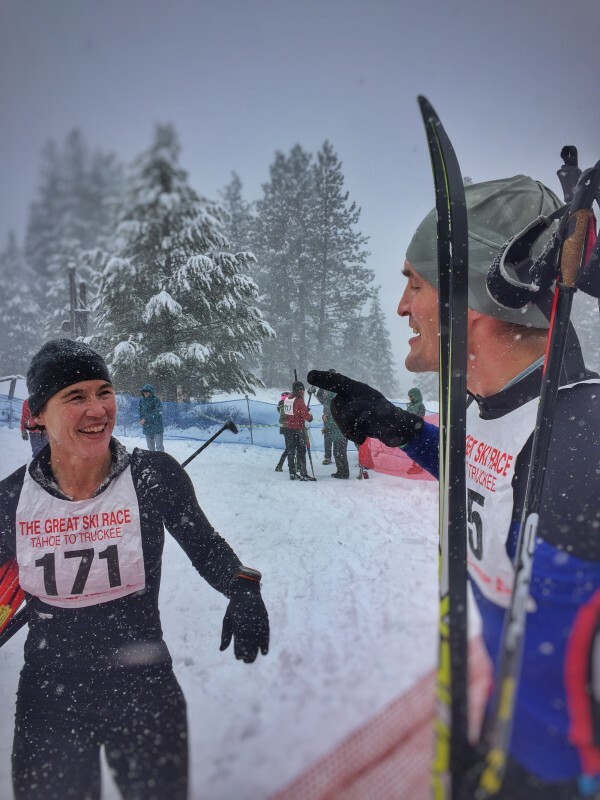 Not just this – ski this race in the snow globe forest – but live here and get coaching so I can improve (thank you Gus & Auburn Ski Club!) and have the opportunity to practice. There was a short run on pavement at the “road crossing” in Truckee. I gingerly tapped the ground in my glass slippers, but can’t complain about getting to do a little of my second-favorite sport. Sunday, 11:02am: I had a small, soft fall at the top of the finish hill (fulfilling my 3-fall track record) before I crossed the finish line in just under 2 hours. I quickly changed into dry clothes and fueled up so that I could watch friends come in and enjoy the spectacle of others coming down the historic ski hill. Getting to the start line of The Great Ski Race this year took a leap of faith. Congratulations to all the hardy souls who did the same and huge thanks to the volunteers of the Tahoe Nordic Search & Rescue team who put on such a positive, fun event regardless of the challenges. They epitomize what it means to live here. 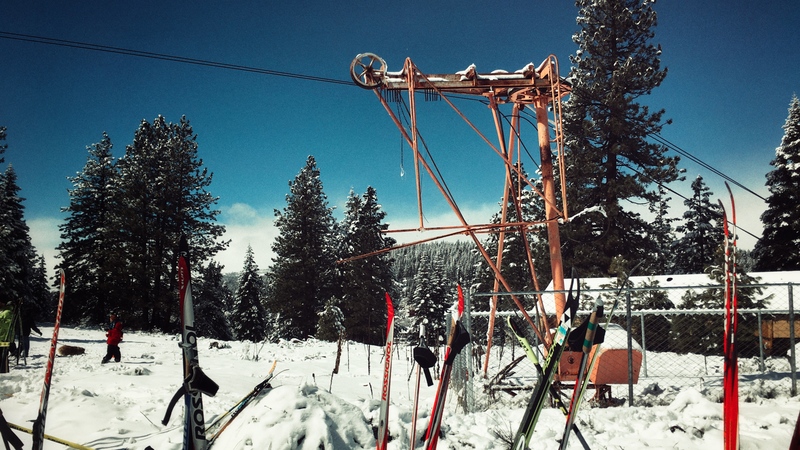 Remains of the Poma lift at Cottonwood’s historic ski hill. Awesome job, Helen!! Such an impressive finishing time, especially with the crazy conditions! Amazing that you improved by 10 min on the long climb – that’s huge. Great to hear the back story behind your conversation with Greg at the finish. And, always nice to see you smiling and fresh-looking at the end of an incredible athletic feat!